Today is a personal anniversary of sorts — on this date in 2007, I walked into Cask & Flask Liquors, located in the McKinleyville Shopping Center, right next to the Safeway grocery store, in McKinleyville, California — about two miles, maybe less, from the Pacific Ocean — and applied for a job. Nothing unusual so far, but it quickly turned strange. The owner was behind the counter, and in a move that’s way-highly-unusual for the circumstance, hired me on the spot. So I trotted around that counter and started work. People don’t normally get hired in such a way — without any knowledge of who I was, or what kind of background, or anything, the owner opened the register, the liquor stock and all the intimate particulars of a business to a complete and total stranger. Although I’d already dropped off a resume, it was apparent the owner hadn’t seen it. Now seven years later, I’m getting ready to call it quits — retiring at the end of this summer. Despite that uplifting crap, she’s kept it running ever since, and has done an outstanding job, considering what happened to the economy. In June 2007, the outerwear of the financial world was picture perfect, but the innards were about to go POW! A deep, fatal tear in the bubble was already hissing. On June 22, 2007, Bear Stearns pledged a collateralized loan of up to $3.2 billion to “bail out” one of its funds, the Bear Stearns High-Grade Structured Credit Fund, while negotiating with other banks to loan money against collateral to another fund, the Bear Stearns High-Grade Structured Credit Enhanced Leveraged Fund. Some say the actual, real start to the 2008 financial meltdown. Demise of Bear Stearns, considering the obscene amounts of so-called money sought after and thrown around near-random, was most-rapid and domino-like — in just more than a year, an 80-year-old “Most Admired” global investment bank worth billions simply ceased to exist. Then in March 2008, after a weekend of intense negotiations, the Federal Reserve approved a $30 billion credit line to help JPMorgan Chase acquire Bear. Reflecting Bear’s dire straits, JPMorgan agreed to pay only about $270 million in stock for the firm, which had run up big losses on investments linked to mortgages. JPMorgan agreed to pay a mere $2 a share to buy all of Bear — less than one-tenth the firm’s market price two days before. The price was later raised to $10 a share. And the financial blow-out overall — from Bloomberg: So if one adds $7.6 trillion of “actual” losses and $5.2 trillion in “avoided” losses, there’s an estimated grand total of $12.8 trillion in costs for the crisis. 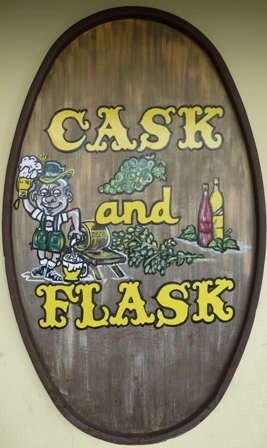 And the old Cask & Flask suffered greatly, too. Although the hardest impact of the meltdown didn’t effect us for a couple of years, ultimately the business lost a shitload of moneyed customers — no longer cash-heavy people buying high-price Glenfiddich or Patrón or expensive wines, now it’s just bottom-feeders looking for cheap vodka. In October 2009, I was made manager of the store, there it’s been ever more. This is the longest I’ve ever worked anywhere since starting work at age 16, and the scenario is starting to crack. I wrote a bit about it on Friday — here if you’re interested. As a 65-year-old, I think it’s time to put a lid on the flask, and roll the cask away. Drink up, everybody — pleze!